Submitted by Denise Azucena on Apr. 19, 2018. Originally published on Apr. 7, 2017 and last updated on Apr. 20, 2018. Portable audio recorders are versatile devices that are used for recording rehearsals, live shows, and field recordings. They are convenient because they are small enough to carry in your bag or pocket. This 2018 updated version of this guide is for you if you want to purchase a recorder to capture better quality audio than you can with a phone app. 89 out of 100. Incorporating 1150+ ratings and reviews. The TASCAM DR-05 is a simple and budget friendly choice when looking for a portable audio recorder. Its omnidirectional microphone helps record surround sounds from different directions. Its peak reduction feature automatically lowers the level of a detected peak sound while recording. It makes it easy to operate by automatically setting the best level while listening to the input and it also works in rehearsal mode and while recording .Other features include the "Variable Speed Audition" which is used to loop and slow down playback without changing the pitch. Many reviewers, who owned this recorder for a long period of time, continue to praise its exceptional stereo recordings and reasonably long recording time. Musicians were able to utilize this in a live band setting and say they gained good results without any distorted noises. Many say it's well designed with quite a sturdy build given its price. It's quite easy to use since its user interface is easy to navigate and has solid buttons. The high volume limiting feature is well regarded for the purpose of avoiding clipping. The "overdub" function is well regarded by multi-track uses. It provides exceptional sound quality and works well in environments with a lot of ambient sound picking it up clearly because of its polar pattern. Some reviewers mentioned its built in speaker and internal microphone have low volume, while some considered the design to be a bit too bulky. Others have experienced static white noise while recording. This digital recorder is a good investment if you are looking for more useful features than a basic recorder and also has a lightweight and sturdy build at an affordable price. 88 out of 100. Incorporating 1300+ ratings and reviews. The H1n is a revamped version of Zoom 's H1. It offers series of new features including its 1.25" monochromatic display with a clean layout and backlight that's visible in dark or direct light, and a redesigned one touch button for recording. Additionally, it has a tone generator feature that syncs up audio with video, great for filmmaking with DSLR and video cameras. There were a number of improvements from the original H1 recorder. For its price, it provided exceptional clear sound quality, even picking up low volumes without any concerns of distortion. A lot of reviewers found it simple to operate with its intuitive and straightforward controls, in which they were able to easily record by just a press of a button. They also found its lock key on the side convenient to prevent pressing buttons by accident. Some reviewers were concerned with its plastic construction not being sturdy enough, although there were no reports of damages. This is generally expected at a given price range. Some reported that it drained batteries too much on standby. This is an excellent choice if you want a portable and no-fuss recorder. 89 out of 100. Incorporating 1050+ ratings and reviews. 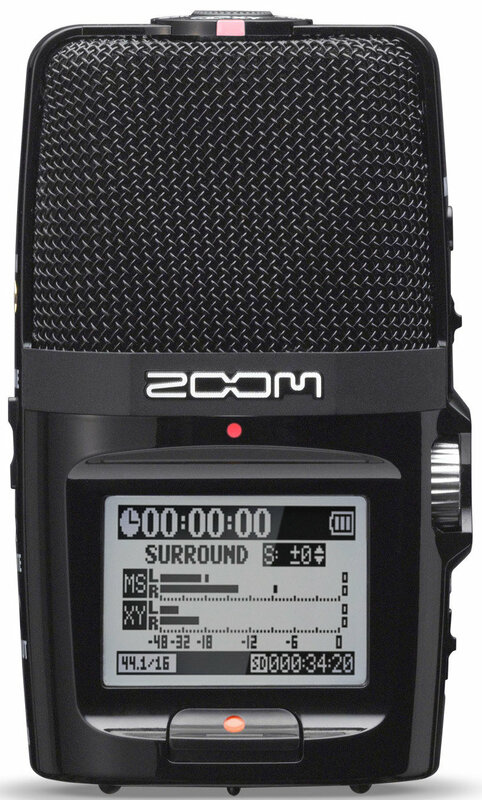 The Zoom H2N looks more like a microphone than a recorder. It can capture different wide-range areas with its 5 built-in microphones and 4 recording modes by turning its dial control. This unit includes effects such as compression, limiting and low cut filtering. Its XY built in microphone allows two matched unidirectional microphones at a 90 degree angle to capture stereo recording. The MS (Mid-side) microphone is based on the mid-side technique where one microphone acts as a center channel, while the two "side" microphones creates ambience either adding or subtracting sound waves. Using both the XY and MS microphone helps record audio from different directions. Numerous reviewers were able to use this recorder in various ways, such as podcasting or field recording. They have continued to praise its longer battery life compared to similar Zoom products. Its compressor and limiter features are very handy in preventing sound peaks clipping. Its internal microphone and preamps provide clean and crisp audio quality, and its lightweight as well. A lot of users commend the ease of use of its rotation switch for different microphone patterns. They also mention hearing distinguishable differences of its 4 different microphone patterns for recording. Some say the microphone is too sensitive that it picks up unwanted external noises such as winds and breezes - this is common issue with many types of mics and you need a windscreen if you're going to be recording in windy environments. Others also mention its build isn't sturdy enough since it's made with a plastic casing - it has a battery door that apparently breaks when not handled carefully. If you want a customizable recorder for professional recording purposes, this is a decent choice. Its versatility and flexibility make it a good investment for the long-run. The TASCAM DR-40 is a solid handheld recorder that offers 4-track recording and adjustable microphones, its internal mics are adjustable from XY to AB position. While the two XY built in microphones are positioned close together at a 90 degree angle, the built-in AB position is when the microphone's configuration pans in left or right to capture the stereo image of audio recordings. The microphone preamps have phantom power so you can use it with external condenser mics. The recorder itself has extra features such as EQ, reverb, optional level align and a chromatic tuner. As many users have pointed out, it is one of the few good quality recorders with XLR inputs at an affordable price. Many of them found its phantom power to be very helpful when recording better audio quality with external mics. The menu is easy to navigate and many people say its dual track recording is one of the best features it has. Its microphones have comparable quality to more expensive counterparts and many say it does the job when it comes to recording high quality audio. Its 4-track recording feature is well regarded, in his Sound on Sound review Tom Flint said, "Although the D40 is, first and foremost, a stand-alone stereo recording device, when it's fitted with external mics it performs four-track recording effortlessly." Some reviewers mention its built-speakers are a bit mediocre and unable to replicate the audio recordings faithfully unless transferred to a computer. Some thought the plastic casing felt flimsy saying the recorder picks up handling noises. A few people report that it has noisy preamps meaning that when you turn the gain right up you get noise issues. This recorder is a good choice if you want to record multi-tracks and audio from different directions while being straightforward and easy to use. The H4N lets you record four tracks simultaneously and includes overdub and punch-in features. You can also use it in 2 channel stereo mode as well with its XY microphone configuration. Your four channel recordings can be mixed down to mono or stereo with independent control over each track level and panning. It also provides audio effects and processing including a compressor, limiter and reverb. Many reviewers continue to praise its phenomenal quality. It's very handy when it comes to multi-track recording because of its 4 channels (including X/Y stereo microphone and 2 XLR balanced and unbalanced combo input), which is useful in field recordings. The preamps of its XLR inputs have been well received in customer reviews. It also has phantom power which is used to power external condenser microphones. The sound quality of its built-in microphone is well liked and provides a natural stereo sound reputed to be as good as using studio microphones. It's also has a menu that is straightforward and easy to operate. Minor issues users have come across include having a lower battery life compared to other recorders and a slow boot time when turning it on. For its price, this recorder is a good investment if you want a flexible unit with multiple features that are useful in live settings. 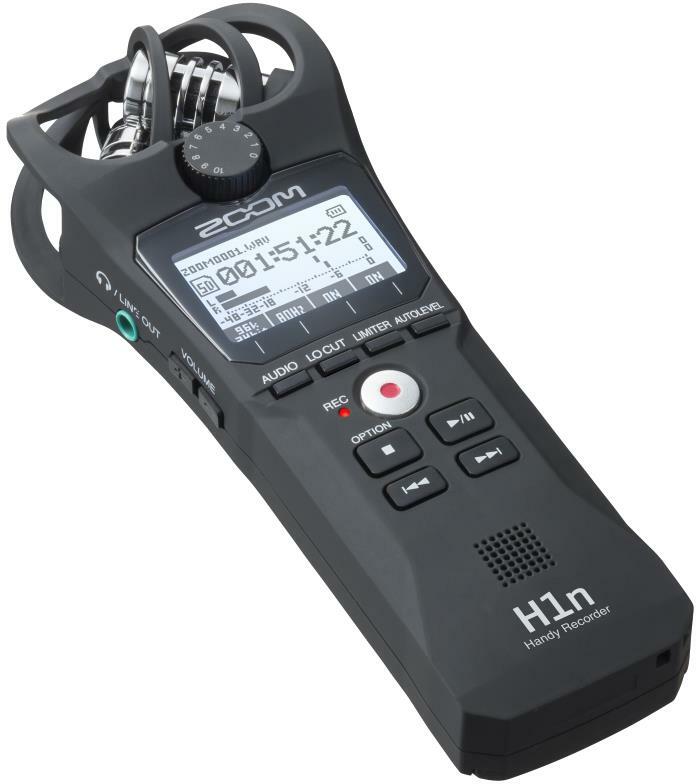 The Zoom H5 is seen as the improved version of the H4N unit. Similar to the H4N, it provides four-track recording two mic/line inputs (XLR/TRS), and phantom power. Additionally, it has a 15 hour run time, transport controls on the front, and interchangeable microphone capsules that are sold separately. Other built-in features include a metronome and a tuner. The overall feedback was still mainly positive when it comes to its build, interface and layout of controls. Its immaculate X/Y microphones provide clear and crisp sound quality with low noise. One of the improved features includes the addition of manual dials which make adjusting gain input easy to do on-the-fly. it's flexible and practical in both editing and simultaneous 4-track recording. Its wide ranging frequency response is another quality that's praised by many users as it was able to capture low end sounds very well. It generally does a good job of picking up sounds at a specific direction with minimal bleeding from other sources. An example of this is in a live setting where some users said it was able to record the performance at a long distance without too much noise from the audience. A number of reviewers have claimed its battery life wasn't long enough. It's XLR outputs don't have locks so you have to be careful not to pull the plugs out while recording. One user pointed out that it doesn't work well with humid weather, and that it's best to invest in a case. Although a little on the expensive side, if you want an tactile flexible unit that has enough inputs for external microphones and a recorder that does simultaneous multi-tracking, then this is a great option for you. 94 out of 100. Incorporating 700+ ratings and reviews. 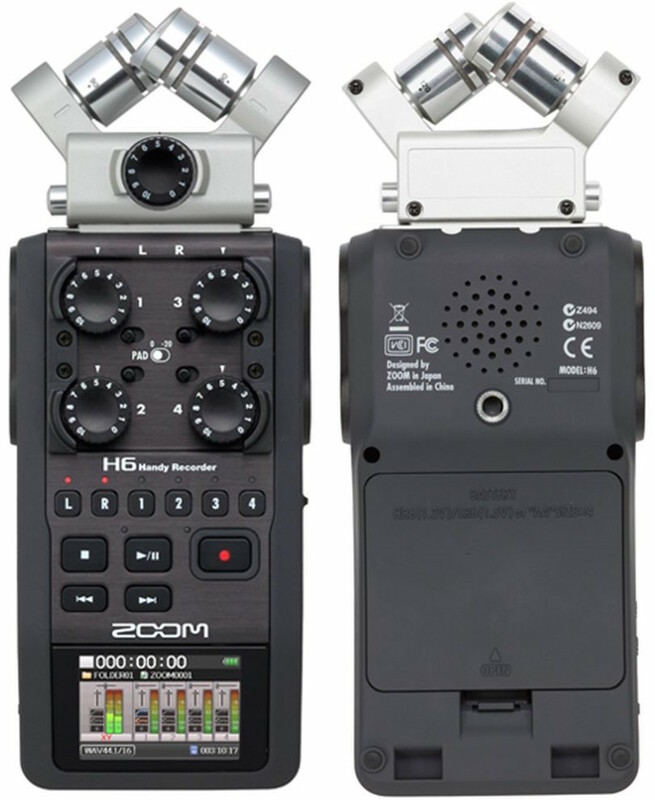 The Zoom H6 is one of most versatile handheld recorders so far produced. It has microphone capsules – XY, MS, Shotgun, and Dual XLR/TRS Combo, that can be interchanged based on preference. These microphones can be changed according what type of stereo imaging you need to record, whether it be just one or multiple directions. It also can record up to 6 tracks simultaneously and has its own dB pad for recording loud sources. It has some interesting features: Pre-record takes the previously recorded two seconds and adds it to the beginning of the new recording. Backup makes two simultaneous recordings with the second recording using 12dB less gain in case the main recording distorts or clips. Despite having multiple features, this recorder wasn't too overwhelming to use. A lot of reviewers were still impressed by its multitrack simultaneous recording feature, and can create up to 6 tracks with its optional XLR capsule. A lot of them mention the X/Y mic capsule and the MS mic capsule provide excellent quality recordings. It boots up fast while turning it on. Many users point out that it has a more professional feel and is easier to use compared to its predecessors. It is very reliable when recording both in indoor and outdoor settings. It's also very handy for recording a whole band using separate microphone inputs. Former Electronic Musician senior editor Geary Yelton said in his review, "Simply put, the H6 is a remarkable piece of machinery. If you’ve ever wished for a 6-track recorder you could slip into your coat pocket, especially one as versatile as the H6, technology has finally caught up with your desires." On the downside the inability of the rotary gain knobs to lock in place means you have to be careful not to change the settings accidentally. Some users say they wish it had a better file management system. This recorder is an excellent choice for anyone who needs the extended multi-tracking facilities. It is highly recommended for professional use. Handheld recorders are very convenient to use in many different settings such as live performance venues, rehearsals and even for recording outdoor ambience. You can use them as stand-alone recorders or for capturing high quality audio with your video recordings. They are also used by podcasters for location recording. Microphone polar patterns determine how much sound they capture from different directions. Some digital recorders have a built-in omnidirectional microphone which captures all the surrounding sound from all directions. Some have bi-directional microphones which capture two opposing directions. Others have a unidirectional built-in microphone which only captures sound from a single direction. For example, if you're recording a singer/guitarist and don't want ambient noise then you'll need one with uni-directional mics, on the other hand a bidirectional mic will allow you to pick up audience sounds as well as the performer. Most recorders have a built-in XY configuration. The XY set-up consists of two cardioid microphones angled at between 90 and 135 degrees positioned at the same point to produce a stereo image. This configuration shows the center of the two microphones panned left and right facing directly at the sound source. Sound arrives at nearly the same time reducing phase problems. Another type of configuration is the MS (mid-side) set-up. This includes a cardioid microphone (mid) that faces directly at the source while having a bi-directional microphone (side) that faces left and right. The “mid” picks up the sounds from the source while the “side” picks up sounds from the side. The AB set-up is another optional microphone configuration. This type includes two cardioid or omni-directional microphones, spaced a few inches apart from each other and panned in left/right. Storage capacity should be taken into consideration when looking for a recorder. They are generally expandable so check which type of storage the one you want uses and you can buy larger amounts of memory for longer recording times. Looking into the types of formats it can record determines whether it can support WAV, MP3 or even both. It is important to know how long a battery lasts when recording to prevent loss of data in the event of power running out. Knowing the type of batteries you need, whether it be rechargeable or replaceable. shows if you need to keep purchasing batteries or if you can use a USB or AC Adapter for charging. Having the right amount of inputs and outputs also depends on how you are going to make use of the recorder. Having a USB connector to store your files in your PC is needed for editing and storing purposes too. For convenience, some recorders have separate headphone outputs and line outputs. Some digital recorders act as audio interfaces as well. There are some portable recorders out there with more than the typical 2 stereo channels. Some of them also provide multi-tracking features in which external microphones can be utilized in addition to the built in microphones. Mid-range priced recorders often have XLR/TS Line inputs for plugging in external dynamic or condenser mics. Extra features that are optional may include effects such as compression, reverb, and EQ. Some include a metronome and playback tempo change function. We looked at all highly rated handheld digital audio recorders that are sold by major American retailers and short-listed the top 16 for detailed analysis. We then examined information from over 9,900 sources, which included retail store feedback, expert reviews, forum posts and more. We then processed the data via the Gearank Algorithm to generate the scores out of 100 that we used to narrow down the list to just the highest rated options above. Finally, we arranged the list by price, and provided important information, specifications and summary reports noteworthy pros and cons for each of the recorders that made the list. For more information about this process see How Gearank Works. Today we removed the Roland R-05 Wave/MP3 Recorder from out recommended list above due to it no longer being available from several major music gear retailers. If you would like to read what we said about it, then you'll find it at: Roland R-05 Meta-Review. Submitted by George Murtie (not verified) on Aug. 22, 2017. I have 2 questions. Can I overdub multiple guitar and bass parts one at a time? Can I plug the handheld recorder directly into monitors? All of the multitrack recorders above, the ones that list the number of Simultaneous Recording/Playback channels, allow you to record additional parts. All of the ones that have a line out listed in the specifications will drive powered studio monitors. Submitted by Mohammed (not verified) on Oct. 15, 2017. "I am totally blind. Does any of those recorders have some voice guidance built in?" So they can be accessible for us as a blind community. Submitted by Jian (not verified) on Dec. 2, 2017. Why Roland R-26 is not in the list? Submitted by Jason Horton on Dec. 3, 2017. The Roland R-26 was on our short-list but didn't quite rate high enough to make it into our recommendations - it was very close though and you can see it's Gearank rating in the Music Gear Database. Submitted by john (not verified) on May. 5, 2018. The PCM-D50 and ICD-SX750D might be quite good but they're no longer widely available so they didn't qualify for this guide. The Sony PCM-D100 was on our short-list, however its ratings aren't high enough for us to recommend it - you can see its rating here. Submitted by Søren (not verified) on Jun. 29, 2018. I am curious why on your updated 2018 list you did not include the TASCAM DR-100mkIII as one of your options? Submitted by Jason Horton on Jun. 29, 2018. It was on our short-list however its ratings weren't high enough for us to include it in the recommended list above. You can see its ratings in the Music Gear Database: TASCAM DR-100mkIII. Submitted by Margot Anand (not verified) on Oct. 22, 2018. Allo Friends, thanks for your analysis, very helpful. I am looking for an audio player that give play back the recording of private seminar information without going via internet. I want to listen, and take notes on a keyboard. Thank you very much for recommending me something! Submitted by Jason Horton on Oct. 23, 2018. Our recommendations are primarily based on music production uses so we can't really help you with that - maybe one of the readers here will have an answer for you.